& still with some FLASH features Start HERE ! >30k items > current Prices ? Evaluation/Demonstration Copy is available - ASK ! You can test your pump by downloading the free trial and seeing if it works. If it doesn't, Then we’ll tell you how ! 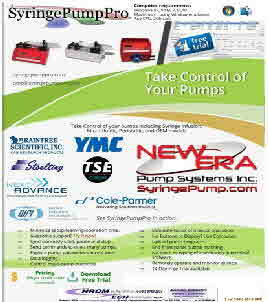 Pump Control S’ware SPP is a Microsoft Windows PC application that can communicate with a variety of Pumps including New Era Syringe Pumps and NE Peristaltic Pumps. 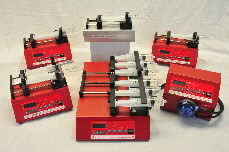 Infusion syringe pumps including some OEM models can be control programmable; . DISCLAIMER : NO Warranty Claims for “wear and tear” mechanical items or usage outside of Specification for each respective pump NO RETURNS ACCEPTED ! but Use sensibly and WITH CARE ! NE has options/accessories eg Analog Boxes for valve interaction / sensor input ? A Pump > New Era, NE-9000(aperistaltic pump, Syringe Pump, NE-1000 Series eg NE1010(High(er) Force 100lb > NE8000 (High Force 200lb) or variants thereof . . . ! some customisation may also be required > consult . . .US! If you need “expert” S’ware Coding HELP ( custom / for a charge (perhaps ? Programming Your Pump . . . but NOT for the Faint-Hearted !
. . . manually programming your pump and getting started writing pump programs can be a real challenge! The initial learning curve is high. So much to learn. There’s plenty to learn about the programming language and how the pump operates. You just want to start getting results – now! We can help you!
. . . and Only FOOLS Rush-In ! Pump Programaming Triggers . . . but NOT for the Faint-Hearted ! Programming Multi Pump Recipies ? How to Specify Your Flow ? TTL Inputs and Outputs ? IF Programming TOO Difficult for U ? > suggestion Use a simple low cost timer to turn pum OFF after a carefully pre-determined time.